← Idaho here we come. Today marks the departure of myself and sweet-marie, Rumrunner1 and Wifey of Tugman and Wifey for Laughing Nevada. We departed sweet-marie’s at some early hour of 6:15 and had to make a couple of stops on the way to Bellingham to grab a few caches. We stopped not far from sweet-marie’s for our first cache of the day. The next stop was in Ferndale Washington for another cache. Today we were trying to do caches in 5 States in a day. BC, Washington, Nevada, California, Arizona. Okay BC isn’t a US state but all Challenges I have seen say 5 States not 5 US States. Since a Province is the equivalent to a US State it counts. We were to fly Alaska Airlines from Bellingham to Las Vegas then rental car to Laughlin. When one fly’s Alaska you can upgrade to First Class for a small charge depending on the distance. In this case the fee is $50 plus you get to check 2 suitcases for free. Alaska recently upped the charge from $20 per suit case to $25 per suit case. Since I decided to take the upgrade I was able to check Rumrunner1’s suitcase for him. The others in our group gave me a bad time and held their noses up in the air as they walked to their seats a little further back in the aircraft. Upon arriving in Las Vegas we deplaning at the new Terminal 3. I have found that once they make their way down to get your luggage it is there. This was the case today. Upon retrieving my suitcase I noticed that a a zipper had been damaged and a small tear in the back of this case. Oh did I say this was a new suit case, first flight? The others in the group pointed out that is what I get for upgrading. We walked outside and grabbed the shuttle and were on our way shortly after getting to the shuttle spot. We managed to get a Jeep Liberty, while it isn’t my first choice it was a 4×4. It didn’t take long before we were on the way south with a quick stop in Henderson for supplies. We headed south down State 95 stopping at a MooseMob cache. This cache would mark our cache in Nevada. We continued along the way grabbing a few more caches before we crossed into California where we went down a dirt road for a few kilometers to get Where’s the Beef cache. Now’s all that is left is Arizona. 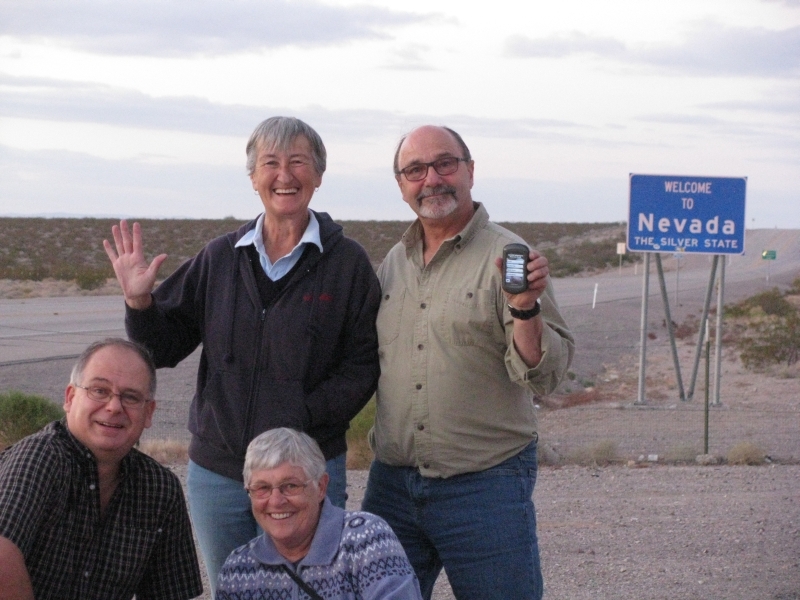 We grabbed another cache nearby before stopping at the Nevada/California State line for a cache and a group photo. from here we headed towards Laughlin and crossed over into to Arizona and Bullhead City where we went to do the closest cache we could park next to which was Bird Watching. This would mark our 5th state in a day. The problem was finding this cache as it was now getting dark and darker by the minute. I walked around to the other side of the tree and looked up and just before I was about to give up I used a flashlight as someone up top moved the branches of the tree and low and behold I spotted it. It was now off to Harrah’s in Laughlin which would be our home base for the next 5 nights. It should be noted that if you want to get good rates then join the hotels gambling club. One doesn’t have to gamble to get credits but what it will do is give you hotel discounts on rooms. In this case my rate was like $7.60 a night with $12.00 on Friday and Saturday night. The room itself was average. The real problem was the $12 a night for internet which was basically useless. Oh yes I shared a room with Rumrunner1 so you can see what the cost was. 🙂 . The first day is done and we managed to log 5 States in a day. This entry was posted in Geocaching and tagged 5 States in a Day Challenge, GC46WR9, GCTPVG, GCZBJN, Geocaching, Laughlin Nevada, Philatsea, Rumrunner1, Sweet Marie, Tugman and Wifey. Bookmark the permalink.